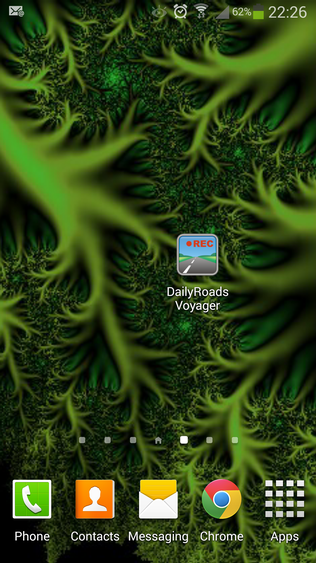 DailyRoads Voyager is a free and versatile dash-cam application for Android based devices which has now become part of my daily driving routine; I get in the car, connect my phone, launch the app, then drive off. Using the application with its default settings provides very good imagery and information for the novice user, while the extensive list of customisable features provides everyone the tools to tailor the system to their own personal needs. In two recent instances I felt confident that, if issues had escalated, the captured video would have provided very useful evidence for the appropriate authorities. The developers website is a very useful one with areas covering support, known bugs and planned releases, and it also allows users to share videos and images with a budding community. One of the most useful features for me, however, is a page containing an explanation of what the various application permissions are and why they are required. The application does not have any widget associated with it but like other apps it can be dragged to any location on your devices screen(s). Starting the application is quick and it then presents its main screen. It's functional and clean. The lions' share of the screen is left to the video preview area and the buttons are large enough to be touched when needed. The configuration options are nicely grouped in the sub-menus, and there is enough detail in the prompts to guide a user through the various options. When sitting in a car, the files and camera mode button may be more difficult to press, but as you should not be driving when manipulating the device this is no real issue. Users are encouraged to try out different settings until the resulting files are suitable for their need. My main purpose for the device is to capture clear details of roads, conditions and traffic in case of an accident. Others use the device in order to capture moments of their journey, or of vistas along their way (as shown in the vendors growing community website). Audio can be captured alongside the imagery if required, either by default or by pressing the microphone icon on the video button. Quality is fine but does pick up all noise in the vehicle and any associated road noise. 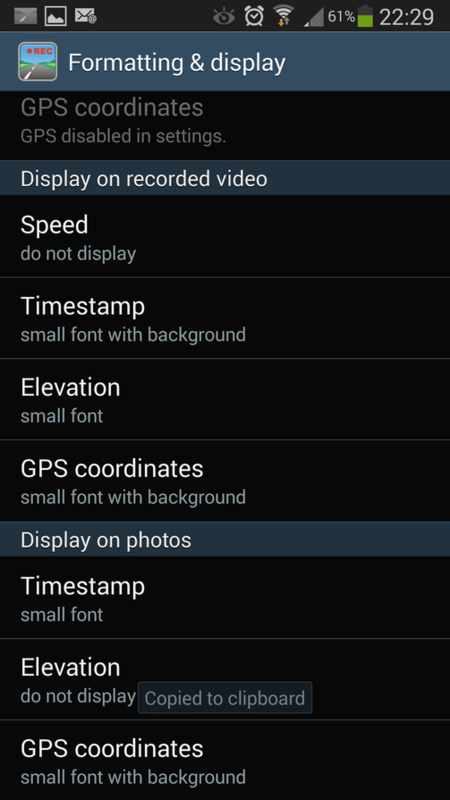 The device can be configured to run in the foreground (showing the video preview) or run in the background. Having the device in the foreground (showing the video) may be a distraction, especially as the system allows the device not to sleep. Foreground running also draws more power from the device. However, foreground mode can stop the device from locking thus making all the features accessible without having to wake unlock the device. Running in the background, the user can concentrate on the driving with the system making audible queues to inform the user when a new video file is being generated and when a still image is captured. These little touches do tend to impress. The application can be set up to record video for a predetermined amount of time, retaining it then starting a new file when the time limit expires, and to take photographs at other user determined times. 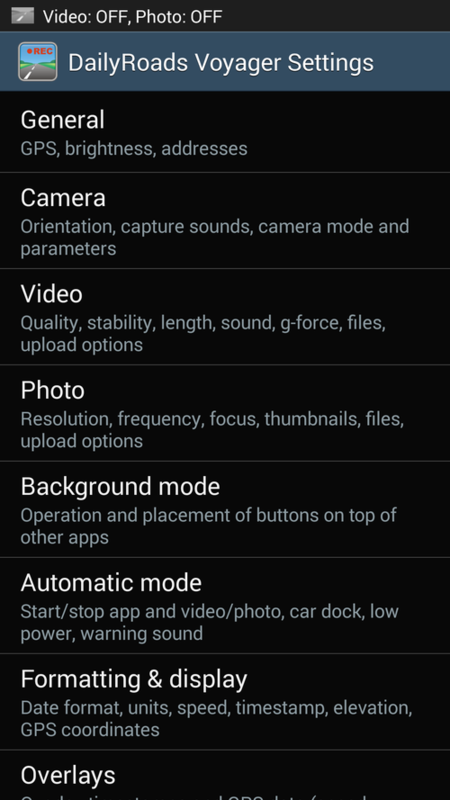 This allows you to (for example) select low quality video with high quality snapshots, saving device memory. When the video time limit expires the system saves the file in a user accessible temporary area and starts a new one. At the users convenience, they can review the videos images and either retain them or delete them the rest , saving space on the device or memory card. 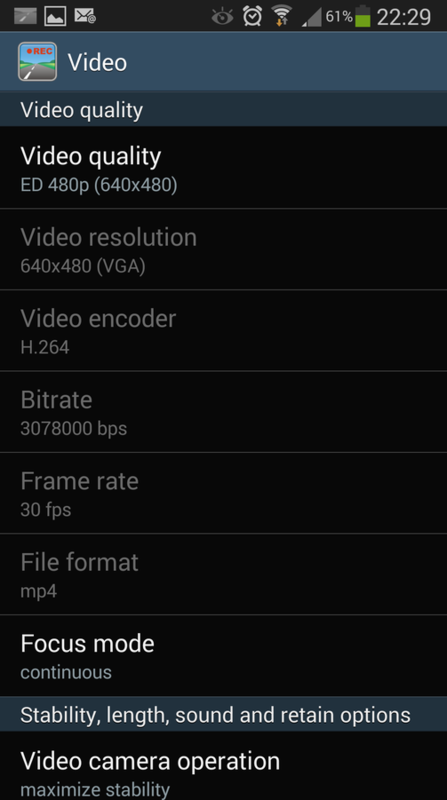 The application gives video priority over static images, so if you require both, the static images are taken when the video is not being used. EG, if the video is set up to start a new file every 60 seconds, and the static images are taken every 15 seconds, you will only get the static image every 60 seconds between the times when as the video is stored and a new file is started. I have configured my device to take medium quality (640 x 480) video, creating a new file every 5 minutes, and take high resolution still images (2048 x 1536) every 60 seconds. (As described above, in reality, the static image is taken every 5 minutes when a new video file is started, but if I pause the video for any reason, the pictures are then taken every 60 seconds). At the end of the journey I review and keep any interesting videos and images and delete the rest. The retained files can then be uploaded to another PC or to the DailyRoads web site and shared with the community. If the device encounters a pre-determined shock (measured in 'g') the system can retain the video automatically; EG, if the car is involved in an accident, the video can be retained without having the user try to save it directly. Alternatively, a quick tap on the preview area will move the file to the retained area, again keeping the video from accidental removal. 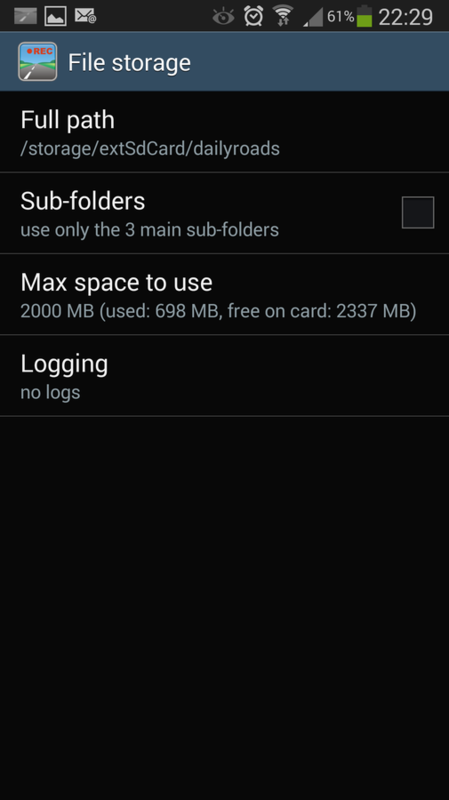 The resulting files are able to be saved to the phone or a memory card and the user can access these via the in-built "files" menu item, or using another application. Temporary videos (older ones first) can be automatically removed if the pre-set file size limit is reached, or the user can move them to another location manually. Again, lots of nice little touches. The user is able to make use of the devices GPS functionality if it exists. 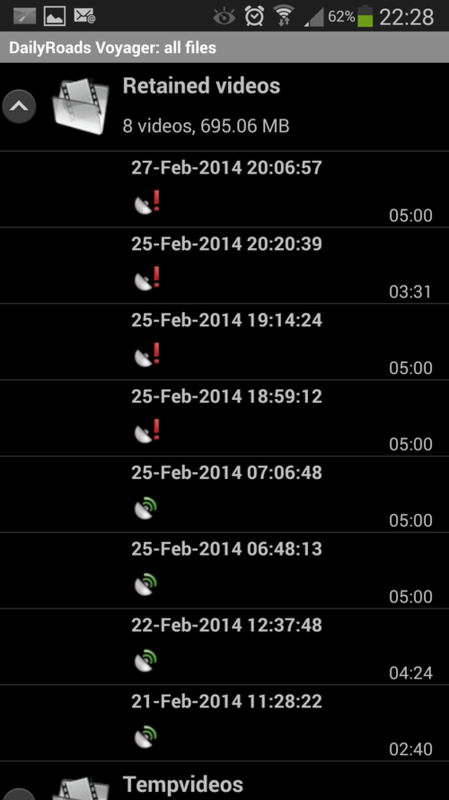 When active, the system records positional information in a separate file. 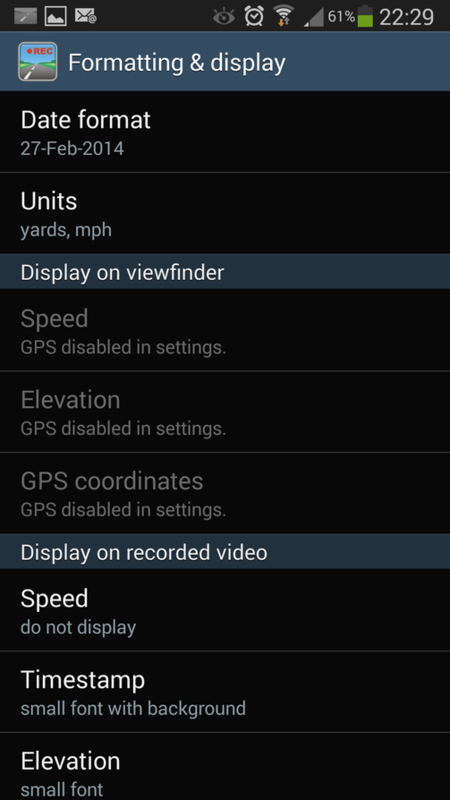 The GPS "location" can be displayed on the preview while running, and saved with the video and during playback, and with the device in portrait mode, the video image is displayed on the top half of the screen and the GPS data, with accompanying Google Map images, displayed in the bottom half. 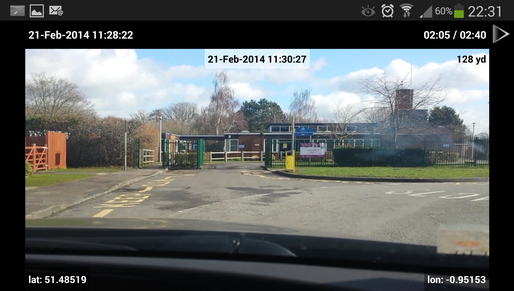 The map is not embedded within the video itself as Android does not support video overlays at present. When the imagery is uploaded to your PC, you will only see the video. 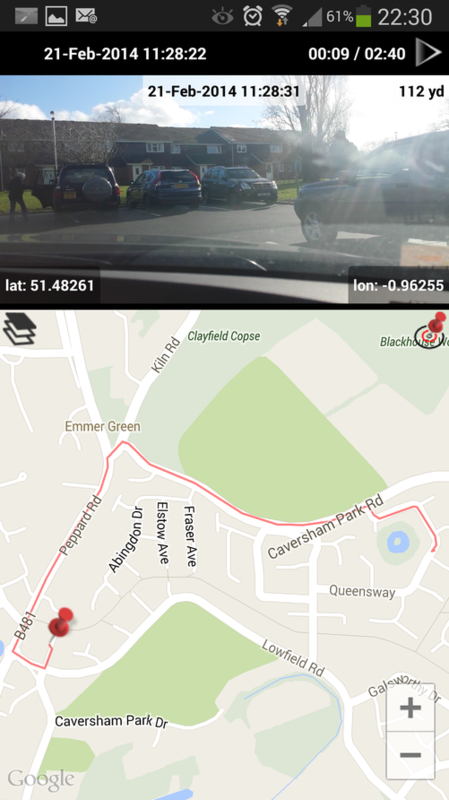 If the files are uploaded to DailyRoads, the relevant GPS data is also uploaded and the system can be displayed with both sets of data - Image and map. 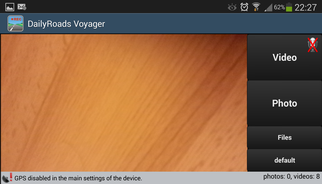 The user can then download the overlayed video for a charge. When video is activated the captured imagery is a little foreshortened - Things in the distance (in reality) seem closer on the video. This is especially noticeable in play back where a slow moving object suddenly speeds up as you pass it. This does not distract from the quality of the footage and may partially be related to moving to the required video resolution during recording. • Whether the device is plugged in to a charger. With Bluetooth on, Wi-Fi off, 640 x 480 video, no static images and plugged into car charger, I do see % power drop over time - A typical regular 90 mile journey sees power drop 8 to 10 percentage points. Again, I do not feel this is a big issue myself, but other users may have different power drain concerns. On long trips, 100 miles or so, I did notice the device getting warm. It's possible that some of the heating was due to the device being close to the windscreen and therefore the due to the heater (can be chilly at 5am in the UK). It's nothing I feel overly concerned about but each users should adjust the settings to take this into account if they feel it necessary. On short trips (20 miles or so), there was no noticeable warming evident. The following files are on YouTube and should be taken as examples of the footage that can be attained using the application. The video preview was on during recording in order to compare and contrast the recording elements with the real-life situation. I would not recommend using the application in the foreground in normal use. All driving was performed in line with the appropriate speed limits and road signs, the weather and road conditions, and within my driving ability. The roads in the video known to me and I drive on the regularly. This review is intended to highlight the benefits and limitations of the system, not provide details on how to use the application itself. Where guidance or notes on use are provided, these are the reviewers observations at the time of review and may not necessarily represent the best, easiest, recommended or proper use of the system.